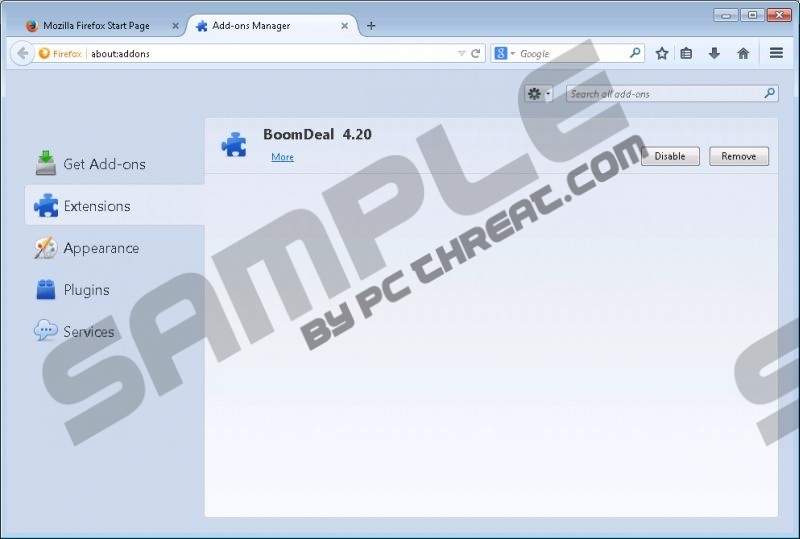 Boomdeal is not a reliable browser extension that you should install onto your browsers to assist you. The application cannot corrupt your web browsers without permission, but you may install it without knowing how it works. Our researchers have found that the app is usually offered to computer users together with other applications. Read the report to learn whether you need to delete this application and whether you need to remove Boomdeal itself. According to our research, Boomdeal has been built using the Justplugit engine. The engine has also been used to create SaverExxtensIon, Coolbuy, Boomcheap, Bestsaveforryeou, and other advertisement-supported programs that you need to delete. Unfortunately, some computer users do not realize that they need to remove adware, because they do not realize that it is active. If you have no idea where Boomdeal has come from, it is most likely that it has been installed by default with other software. This does not mean that the program has slithered in illegally. If you install Boomdeal accidentally, it is possible that other undesirable programs are active on your operating system as well. Boomdeal and the associated applications may be installed onto your PC via Installrex, Amonetize, Vittalia, and similar third-party installers. We recommend scanning your operating system to make sure that the installed apps do not require removal. If you do not perform this step, you may allow truly malicious programs to remain active on your system unchecked. A legitimate malware scanner will recommend deleting Boomdeal as well, because it is not a reliable program. It is obvious that the developers of Boomdeal work hand in hand with online advertisers. In fact, it is possible that the application has been created by advertisers themselves. The app has two purposes: to collect as much information about your virtual activity as possible and to display third-party ads. If you do not remove Boomdeal from your operating system, you will have to worry about facing unreliable advertisements as well. Even though the app may display reliable offers, the risk of facing unreliable ads is too high, and so you should remove the program without further delay. Have you already decided how you want to delete Boomdeal? The manual removal of this ad-supported program is quite simple, and you can perform it using the guides below. Of course, you should not forget about other active threats. If they exist and you do not know how to delete them, we recommend installing automatic malware removal software. Click Start on the Task Bar to open a user menu. Identify the undesirable app, click it once, and select Remove. Navigate to the left of the Task Bar and click the Windows logo. Right-click on the Metro UI screen and select All apps (Apps menu). Quick & tested solution for Boomdeal removal.